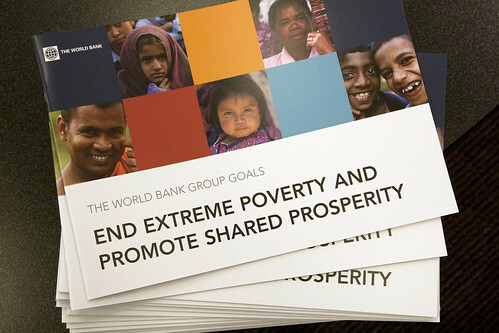 The World Bank has committed itself to twin goals: eliminating extreme poverty by 2030 and boosting shared prosperity, measured as the income of the bottom 40 percent in any given country. This recently inspired a post by Nancy Birdsall arguing that median income would be a better measure of shared prosperity, and another post by Lant Pritchett arguing that the extreme poverty goal is too narrow, which sparked comments by Martin Ravallion and others. My view on those intriguing issues is that the train has already left the station. The question of what the goals are has been settled, and the question we are now pondering within the World Bank is what it means to “operationalize the goals.” We understand that projects should be prioritized in terms of how much they contribute to these goals. But how? I see two ingredients to thinking through this question. First, what is the expected causal chain for how a particular project will contribute to the goals? Second, what is the evidence for the links on that chain? These projects reduce extreme poverty or boost the bottom 40 percent by directly targeting individuals or households. The clearest case in this category is a cash transfer. At the other end of the spectrum are projects that are thought to raise overall economic growth, which may pull people out of extreme poverty and boost the income of the bottom 40 percent. An example would include technical assistance to improve the business environment. In between the two extremes are projects which target neither individuals nor the economy as a whole. Localized infrastructure projects would fall in this category. For “direct impact” projects, the causal chain is short and it’s clear the kind of evidence that could be brought to bear—studies based on household or individual surveys. For “growth impact” projects, we can first ask what is the evidence that a particular project will boost economic growth. Next we can consider the evidence that growth will reduce extreme poverty or boost the bottom 40 percent, where the particular country’s track record could be taken as a rough guide. The thornier cases are those in the “intermediate impact” bin, for which the causal chain is often longer. For example, consider a highway project in a major city where few bottom 40 percenters live. The project can be expected to boost the city’s growth, which will boost nationwide growth through many channels. A concern I have heard repeatedly about trying to operationalize the goals is “you can tell a nice story about any project.” This is exactly why it’s crucial that the thinking be focused on evidence. Many possible kinds of evidence could be used across a range of rigor including studies based on experimental and quasi-experimental designs where feasible, cross-country growth regressions, case studies, synthetic controls, and even economic theory. If the evidence is weak that a particular project will help achieve the goals, we should ask ourselves if the project really should be a priority for the World Bank. Certainly, we want to encourage innovative approaches—which will necessarily include those without firm evidence. But in those cases, the proposed project should include a plan to generate evidence on its impacts, so that we fully exploit the opportunity to learn. All of this is very much an open question in the World Bank. What are your views on how the Bank should operationalize the goals? Love the "Shared Prosperity" Concept ! You have to find people who are willing to share and help. Not just talk about it do something about it. indeed! Perhaps a labour migration initiative is a classic example of a lot of people sharing. Sharing by destination and source countries stakeholders to the return on investment evidenced by the social and financial remittance to source countries by their diaspora. What if there is a tradeoff between reducing extreme poverty and boosting sahred prosperity. Is that out of the realm of possibilities? Growth impact projects may reduce extreme poverty through employment generation for the poor while at the same increase disproportionately the incomes of the top 40 percent who are better capable of taking advantage of opportunities created by growth impact projects. Franciscka: I'm glad you like the concept the Bank has adopted. Zahid: since the extreme poor are part of the bottom 40%, any policy or program which reduces extreme poverty will also necessarily boost the incomes of the bottom 40%. So it's difficult to see a case of an actual conflict between the two goals. One way can be to provide venture capital firms with a corpus of funds to invest in the sectors generating income for the poor. Second way can be to organize a competition amongst the firms generating income for the poor and fund them. Third way can be the funding of Micro Credit. Thanks for your comment. What you suggest broadly falls into the set of things the International Finance Corporation (part of the World Bank umbrella) does, and the IFC is currently trying to figure out how to orient its work to better fit the goals. The bank should support pro-poor policies in the health and education sectors. Introduction of National health insurance schemes that promote financial protection from improvishment from medical costs at the time of illness ,ensure acess to effective quality healthcare and promote cross-subsides would lead to a healthier population which in turn leads to a more productive and prosperous nation. Secondly investments in education would boost human capital and provide opportunties to break the poverty cycle for many poor familes. Finally fair international trade as opposed to aid woulf have a dramatic impact in reducing poverty worldwide. Thanks for your comment. You suggestions for programs in health, education, and trade are all good ones, and these are all areas where the World Bank is heavily involved--including analysis, technical advice, and financing. The Bank has devoted a large part of its financing in particular to health and education since the 1990s, and those areas are likely to receive emphasis in the more recent focus on "science of delivery." The Bank should be looking for ways to channel support direct to representative organizations of the urban poor through funds to which they can apply and whose spending is accountable to them - these also to encourage partnerships with local government. Getting development needs met and building local capacity. See http://www.youtube.com/watch?v=95Lq2T9OoFo and please drop the universal application of the dollar a day poverty line as we know that the costs of food and non food needs are much higher than this in most cities. Unless of course World Bank staff who live and work in cities can show how they can get their needs met on this amount.